The Trump administration's plan to soften methane standards for the oil and gas industry is the first step in a larger effort to dismantle greenhouse gas rules for the booming sector. It might also cloud the reputation of natural gas as a climate-friendly solution to rising temperatures. EPA wants to make several technical changes to how oil and gas operators monitor, detect and repair methane leaks. Those so-called fugitive emissions have become central to how favorably natural gas, of which methane is a major component, compares with coal in electricity generation. 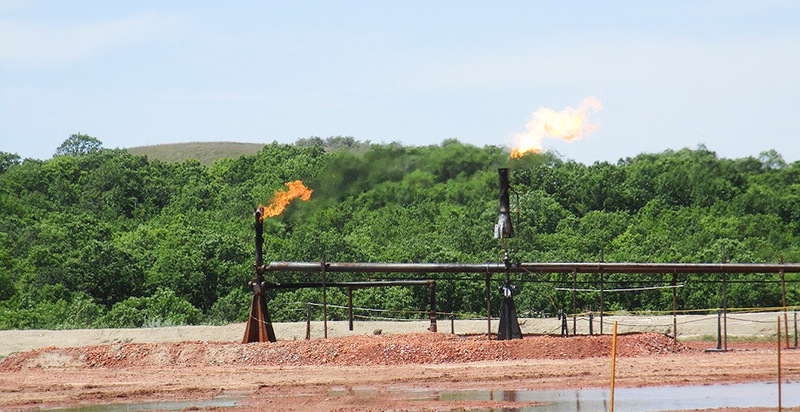 A bigger blow to the methane program is expected later this fall. EPA is still tussling with a separate rulemaking about whether to cease regulating the potent greenhouse gas directly. Legal questions loom over that question, and industry is divided over ending the program. Taken together, the proposed changes yesterday and the anticipated one coming later this year could defang EPA authority over a greenhouse gas that's 84 times more potent than carbon dioxide on a 20-year time scale. "It appears to be a very deliberate strategy to dumb down the rule," said Matt Watson, an associate vice president at the Environmental Defense Fund. The agency said its proposal yesterday would "significantly reduce regulatory burden" and "streamline requirements" by relaxing methane monitoring at new and modified well sites and at compressor stations. It emphasizes the ability to use emerging remote technology and satellites rather than perform check-ins at the ground level, though defenders of the rule noted that those options were never forbidden. It also would let operators follow existing state standards even if they're less stringent than federal requirements (Greenwire, Sept. 11). "The EPA rule will make technical changes to take care of the myriad problems with cumbersome record-keeping, technicalities that don't work in the field and making the rule practical to implement," said Kathleen Sgamma, president of the Western Energy Alliance. Dialing back the standards has implications for the oil and gas sector's contribution to greenhouse gas emissions and public health. EPA said its proposal would increase methane emissions by 380,000 short tons through 2025. It estimated that industry could save up to $484 million, compared with $54 million in lost climate benefits, though the latter reflects only domestic effects. The Trump administration has faced criticism for lowballing the effects of greenhouse gas emissions on the global climate. EPA acknowledged that its proposal would likely "degrade air quality and adversely affect health and welfare" and that "data limitations prevent the EPA" from assessing the unrealized health benefits from ditching the standard set under former President Obama. The Bureau of Land Management is expected to release a separate proposal this week to replace Obama-era regulations on venting and flaring from oil and gas operations on federal lands. The moves come as the natural gas industry has positioned itself as a cleaner alternative to coal. Cheap natural gas resulting from the shale energy boom has been credited with reducing U.S. emissions by replacing coal in the electricity sector. Natural gas has half the carbon density of coal. "Significantly, methane emissions from the oil and natural gas industry are already down 14 percent since 1990 while production has increased by 50 percent," said Howard Feldman, senior director of regulatory and scientific affairs with the American Petroleum Institute, in a statement. "Clean natural gas produced through advanced technologies like hydraulic fracturing has helped reduce carbon emissions to 25-year lows." Environmental groups and scientists claim that EPA and industry have historically undercounted leaks. "The issue really comes down to we need to get a handle on these leaks as quickly as possible, and at the moment, at the federal level, there's very little regulation," said Romany Webb, a senior fellow with Columbia Law School's Sabin Center for Climate Change Law. "The driving force behind the Obama-era regulation was to really ensure we are finding those leaks more quickly." Industry contends that the regulations are redundant and unnecessary. That's because companies have a financial incentive to prevent leaks of methane, since it's the main component in natural gas, a product they can sell. Several large firms, such as BP PLC, have committed to reducing methane leaks. They see it as a way to promote the fuel as a long-term solution to climate change, rather than a "bridge" to zero-carbon energy sources like solar and wind (Climatewire, June 29). "When it comes to EDF and the environmental lobby, it's not about what's really going on in the field. It's about wrapping oil and gas in red tape so there's less of it. That's the game," Sgamma said. Watson of EDF said EPA risks letting the industry's methane problem get out of hand without frequent monitoring. He added that President Trump's proposal is "designed to cater explicitly to the lowest performers in industry," not oil giants like BP. If methane leaks are as undercounted as EDF and many scientists say, unabated emissions could undercut the industry's claim that natural gas is a climate-friendly fuel source, he said. Studies vary on how big a problem methane leaks are for the industry and the climate. The disparities result from several factors. Technologies and methods are key — measuring leak rates for different component parts and totaling them up can differ from, say, flying a plane or satellite overhead to visualize the emissions. Access to oil and gas sites can also be restricted. EDF tried to split the difference in a recent study. It convened 140 researchers from 40 institutions and companies to synthesize the range of methods and approaches used to measure leaks. It found that EPA had undercounted methane emissions from the oil and gas sector by 60 percent, though industry has disputed those findings (Climatewire, June 22). On top of all that, natural gas and oil production is thriving. That means deregulatory moves that result in missing leaks could have a multiplier effect on emissions. That differs from the Trump administration's proposal last month to weaken rules on carbon emissions at power plants, because coal, the main beneficiary, is facing an inexorable decline. "As it continues to grow, those emissions could potentially increase," Webb, of the Sabin Center, said of natural gas. "All of those emissions have a significant near-term warming effect."